Objective: The aim of this study is to investigate the effect of microbiological characteristics of causative organisms on the scintigraphic patterns of labeled-white blood cells (WBC) scan in cases of proven osteomyelitis. 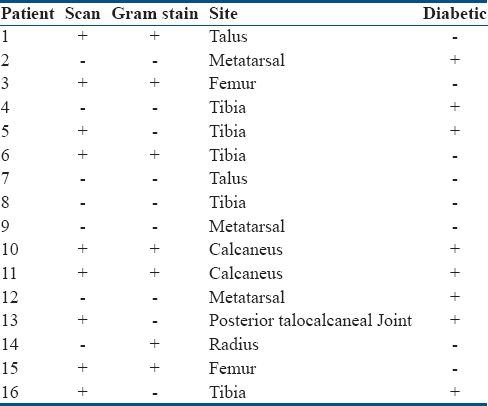 Materials and Methods: Retrospective analysis of 25 patients referred with suspected osteomyelitis and had both bone and labeled-WBC scans performed and complete records of the microbiological culture of the causative organism. The bone and labeled-WBC scans were retrieved and reviewed by two nuclear medicine physicians. Any definite focal accumulation of labeled WBCs within the bone was considered positive for osteomyelitis. Diagnosis of osteomyelitis in the discharge summary was considered the reference standard and was based on a combination of the clinical scenario, imaging, and laboratory findings including microbiology. Correlation of the pattern of labeled WBC and the type of microorganisms was done. Results: A total of 16 patients were included in this study, seven females and nine males. Of these, seven patients had Gram-positive whereas nine patients had Gram-negative organisms. The majority (85.7%) of Gram-positive organisms showed increased accumulation of labeled WBCs, whereas only one-third (33.3%) of patients with Gram-negative organisms had such finding. Conclusion: The pattern observed in this study shows that the false-negative results of labeled-WBC scans were mainly noted in patients with Gram-negative as opposed to Gram-positive infections. This confirms the experimental animal study findings that the secretion of anti-chemotactic factors by Gram-negative organisms, seems to be inhibiting the migration of labeled WBCs to the site of infection. The inhabitation is decreasing the accumulation of labeled WBCs and consequently resulting in a false-negative finding. The study adds to evidence that microbiological characteristics of the causative organisms are another explanation for the false-negative WBC in proven osteomyelitis. The diagnosis of osteomyelitis can be challenging and depends on clinical findings, laboratory tests, and imaging studies supported by tissue culture. Gram-positive bacteria are the primary causative agents of osteomyelitis and Staphylococcus aureus is by far the most common in all age groups. Osteomyelitis can also be caused by Gram-negative bacteria, especially in patients with certain predisposition such as sickle cell disease, diabetes, and trauma. Multiple morphologic and functional imaging modalities have been used with different sensitivities and specificities. Conventional radiographs are usually used first due to its wide availability and low cost. However, plain radiographs usually have limited value due to their low sensitivity for acute infections as the anatomical changes are usually seen in late stages of the disease. Computed tomography (CT) provides good anatomical information. However, its ability to differentiate bone from soft-tissue infection is limited. In addition, its value is diminished in postsurgical cases with a metallic implant. On the other hand, magnetic resonance imaging (MRI) provides high-resolution images with the good ability to differentiate soft tissue from bone infection. It has high sensitivity in detecting osteomyelitis, but its specificity is limited by many causes of false positive results such as postsurgical changes, bony infarction, and Charcot's joint. There are multiple nuclear medicine procedures that are used in diagnosing osteomyelitis. 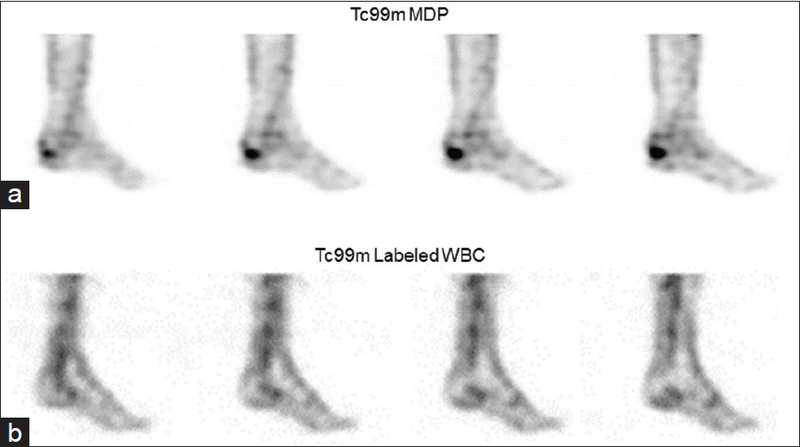 Multi-phase bone scintigraphy using technetium-99 m-diphosphonates (Tc-99 m) provides an early diagnosis with comparable sensitivity to MRI. However, it has low specificity as multiple potential causes can result in false-positive results. The specificity of bone scan can be improved when it is combined with labeled white blood cells (WBC) scan. Labeled WBC study is the most accurate study in diagnosing acute osteomyelitis. The combined approach using bone and labeled-WBC scans provide comparable sensitivity and superior specificity in comparison to MRI. Although the combined approach has generally acceptable accuracy (ranging from 79% to 100%), many factors should be considered before choosing this approach. The duration (acute or chronic) and the location (axial or appendicular) of the infection may affect the accuracy of this technique. Furthermore, the microbiological characteristics of the causative organisms may also influence the accuracy of the procedure. Multiple studies reported low sensitivity of labeled WBC scan for the detection of vertebral osteomyelitis. Palestro et al. reported a low sensitivity (39%) of In-111 WBC in 28 patients with proven vertebral osteomyelitis. Another study on 22 patients with spine infections reported a sensitivity of only 17%. Hovi also reported three cases of histologically proven osteomyelitis detected by MRI but none by Tc-99 m-hexamethylpropyleneamine oxime (99m Tc-HMPAO)-labeled WBC studies. The exact reason for this observation has been uncertain, and there are several possible explanations. The diagnosis of vertebral osteomyelitis is often delayed, and most infections become chronic which lowers the sensitivity of labeled WBC scan. Another possible explanation is that infection results in very high pressure in the vertebra and therefore, labeled WBCs could not migrate to the focus of infection during the available time for imaging. Palestro and Love proposed that marrow uptake of labeled WBCs in the normal spine may be greater than in the infected bone, masking the abnormality or causing a relative photogenic region. Finally, Fernandez-Ulloa et al. suggested that Gram-negative organisms could be behind this finding since they secrete anti-chemotactic factors. A preliminary animal study with rabbits confirmed that Gram-negative infections in vertebral and femoral osteomyelitis are associated with low to no accumulation of labeled WBCs. The aim of this study is to investigate the microbiological characteristics on labeled-WBC scan in cases of nonvertebral osteomyelitis since high-pressure theory is not a factor in such sites. Retrospective review of cases referred to the Department of Nuclear Medicine for suspected osteomyelitis from September 2009 to September 2013. Only 25 patients, who had both bone and labeled-WBC scans performed and had complete records of the microbiological culture of the causative organism, were included in the study. The data were collected and attained from nuclear medicine department picture archiving and communication system, patients' hospital files and Laboratory Information System. Data of these selected 25 patients with complete records were analyzed. The three-phase bone scan was performed following the intravenous administration of 740–1,110 MBq (20–30 mCi) of Tc-99m-methylene diphosphonate. The dynamic blood flow images were acquired immediately after the radiotracer administration over the region of interest. The blood pool images were obtained after 5 min. Delayed whole-body images, as well as spot images, were obtained after 3 h. Single-photon emission CT (SPECT) and SPECT/CT images were also obtained on selected cases when the accurate anatomical correlation was needed. Labeled-WBC scan was performed the following day. The patient WBCs were labeled with 25 mCi of 99m Tc-HMPAO and re-injected intravenously. Whole-body and spot images of the area of interest were acquired at 2 and 4 h after the radiotracer administration. Furthermore, SPECT and SPECT/CT images were acquired on selected patients for correlation with the bone scan. The bone and labeled-WBC scans were retrieved and reviewed by two nuclear medicine physicians. The images were interpreted based on visual assessment of the uptake pattern of labeled-WBC in correlation to the bone scan. Any definite focal accumulation of labeled WBCs within the bone was considered positive for osteomyelitis. All patients selected in the analysis had also microbiological and inflammatory markers performed. The final diagnosis of osteomyelitis in the discharge summary was considered the reference standard and was based on a combination of the clinical scenario, imaging, and laboratory findings including microbiology. Among the 25 patients studied, seven patients were excluded from further analysis since osteomyelitis was not their final diagnosis. In addition, two patients with proven osteomyelitis were excluded from the final analysis as they had a combination of mixed Gram-positive and Gram-negative bacteria in culture. The remaining 16 patients included seven females and nine males with age ranging between 20 and 75 years (mean 51.2) were included in the final analysis. None of the patients were given antibiotics for >48 h before scans. In the investigated cases, the osteomyelitis was located at the tibia in five cases, three cases at the metatarsal, two at each of the talus, femur, and calcaneus, as well as one case at each of the radius and posterior talocalcaneal joint. Eight out of the 16 patients included were diabetics. Majority of the patients with Gram-negative infections (six out of nine, 66.7%) were diabetics, and only two out of the seven patients with Gram-positive infections are diabetics [Table 1]. Seven patients had Gram-positive bacterial infection, whereas nine had Gram-negative infection [Table 2]. Out of the seven cases with Gram-positive infection, six (85.7%) had increased uptake of labeled WBCs [Table 3]. The majority of the positive labeled-WBC scan cases of Gram-positive bacterial infection were due to eus (83.3%). Out of the nine Gram-negative bacterial-infected cases [Table 4], only three had increased uptake (33.3%), whereas the other six had no-uptake (66.7%) on their labeled-WBC scans. 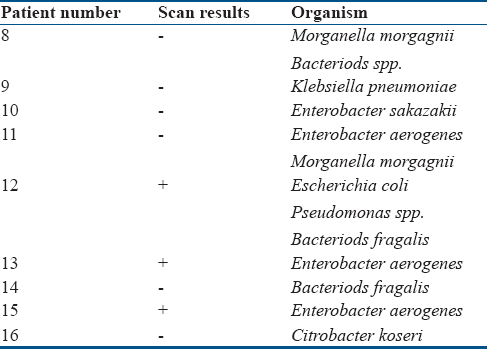 Two of the three patients with increased labeled WBCs uptake were infected with Enterobacter aerogenes e the third patient was infected with multiple Gram-negative organisms [Table 3]. [Figure 1] illustrates an example of Gram-negative bacterial infection at the foot with no-uptake of labeled WBCs. Gram-positive organisms are known to be the main cause of osteomyelitis; however, Gram-negative organisms such as Pseudomonas aeruginosa d Klebsiella pneumonia can also cause osteomyelitis, especially in the diabetic foot, hospital-acquired infections, and intravenous drug abusers., In this study, seven of the 16 patients with proven osteomyelitis were infected with Gram-positive organisms while nine patients had Gram-negative bacterial infections. The majority of patients (85.7%) with Gram-positive infections had positive labeled-WBC scans. As well, the majority of patients (66.7%) with Gram-negative infections had negative labeled-WBC scans. The majority of patients in this study were infected with Gram-negative organisms which was likely due to the higher presence of diabetes (66.7%) in this group. However, the main goal of this study was to investigate the pattern of labeled-WBC uptake in Gram-negative caused osteomyelitis. The pattern observed in our small group of patients with nonvertebral osteomyelitis is consistent with the findings advocated by Fernandez-Ulloa et al. in their five cases of vertebral osteomyelitis. They noted that the abnormally decreased uptake of labeled WBCs in patients with proven vertebral osteomyelitis was mainly observed in the presence of Gram-negative organisms. Kim et al. in 1987 and Palestro et al. in 1991 have also reported false-negative labeled-WBC scans in patients with proven osteomyelitis mainly in cases associated with Gram-negative infections. It has been proposed that false-negative labeled-WBC scans of vertebral osteomyelitis are likely due to increased compartmental pressure which may prevent accumulation of labeled WBCs. However, observing the same trend of decreased accumulation of labeled WBCs in nonvertebral osteomyelitis in animal and human studies indicates possibly a different explanation. In a preclinical study, Elgazzar et al. induced osteomyelitis in the vertebral and femoral bones in rabbits. The expected increased labeled WBCs uptake was observed in 14 out of the 16 sites, including both femoral and vertebral, of Gram-positive induced osteomyelitis. However, they found that 13 out of the 16 sites, including both femoral and vertebral, of Gram-negative induced osteomyelitis had no or decreased uptake of labeled WBCs. Since the decreased to no-uptake of the labeled WBCs was observed at both vertebral and nonvertebral osteomyelitis, then the theory of increased vertebral pressure may not be the explanation for this observation as the nonvertebral osteomyelitis does not exert this kind of pressure. Therefore, Elgazzar et al. suggested that the false-negative results in cases of Gram-negative osteomyelitis could be due to the secretion of anti-chemotactic factors by these organisms with defective chemotaxis. Gram-negative organisms, unlike Gram-positive ones, are known to be associated with defective chemotaxis as they secrete anti-chemotactic factors as reported by some studies.,, The anti-chemotactic factors secreted by the Gram-negative organisms may prevent accumulation of enough labeled WBCs at the site of infection and therefore, decreasing the uptake of labeled WBCs and resulting in false-negative scans. The findings of some positive scans in the Gram-negative group probably reflect the degree of severity of the infection and consequently the amount of anti-chemotactic factors secreted by the organisms. Thus, if the Gram-negative bacterial infection is not severe, then the amount of anti-chemotactic factors is not enough to prevent accumulation of labeled WBCs and thus a positive scan of Gram-negative induced osteomyelitis is seen. On the other hand, the negative results of the Gram-positive induced osteomyelitis may be attributed to milder infections with low accumulation of the labeled WBCs. The study has enforced the observation that the possible reason for false-negative labeled-WBC scans in cases of osteomyelitis is the Gram-negative bacterial organisms. Gram-negative organisms secrete anti-chemotactic factors which may reduce accumulation of labeled WBCs at the site of infection resulting in a false-negative scan. Our study adds evidence that one explanation of false-negative WBC in proven osteomyelitis is the microbiological characteristics of the causative organisms. Since the number of patients studied in this analysis is small, a larger study is warranted. Kumar JV, Robbins SL. Acute and chronic inflammation. In: Cotran RS, Kumar JV, Collins T, Robbins SL, editors. Robbins Pathologic Basis of Disease. 6th ed. Philadelphia: Saunders Elsevier; 1999. p. 25-46. Carek PJ, Dickerson LM, Sack JL. Diagnosis and management of osteomyelitis. Am Fam Physician 2001;63:2413-20. Kaim AH, Gross T, von Schulthess GK. Imaging of chronic posttraumatic osteomyelitis. Eur Radiol 2002;12:1193-202. Kruskal JB. Can USPIO-enhanced spinal MR imaging help distinguish acute infectious osteomyelitis from chronic infectious and inflammatory processes? Radiology 2008;248:1-3. Gold RH, Tong DJ, Crim JR, Seeger LL. Imaging the diabetic foot. Skeletal Radiol 1995;24:563-71. Hatzenbuehler J, Pulling TJ. Diagnosis and management of osteomyelitis. Am Fam Physician 2011;84:1027-33. Ivancević V, Dodig D, Livaković M, Hancević J, Ivancević D. Comparison of three-phase bone scan, three-phase 99m-Tc-HM-PAO leukocyte scan and 67-gallium scan in chronic bone infection. Prog Clin Biol Res 1990;355:189-98.
de Winter F, van de Wiele C, Vogelaers D, de Smet K, Verdonk R, Dierckx RA, et al. Fluorine-18 fluorodeoxyglucose-position emission tomography: A highly accurate imaging modality for the diagnosis of chronic musculoskeletal infections. J Bone Joint Surg Am 2001;83-A: 651-60. Palestro CJ, Kim CK, Swyer AJ, Vallabhajosula S, Goldsmith SJ. Radionuclide diagnosis of vertebral osteomyelitis: Indium-111-leukocyte and technetium-99m-methylene diphosphonate bone scintigraphy. J Nucl Med 1991;32:1861-5. Whalen JL, Brown ML, McLeod R, Fitzgerald RH Jr. Limitations of indium leukocyte imaging for the diagnosis of spine infections. Spine (Phila Pa 1976) 1991;16:193-7. Hovi I. Complicated bone and soft-tissue infections. Imaging with 0.1 T MR and 99mTc-HMPAO-labeled leukocytes. Ff. Acta Radiol 1996;37:870-6. Elgazzar AH, Dannoon S, Sarikaya I, Farghali M, Junaid TA. Scintigraphic patterns of indium-111 oxine-labeled white blood cell imaging of gram-negative versus gram-positive vertebral osteomyelitis. Med Princ Pract 2017;26:415-20. Palestro CJ, Love C. Radionuclide imaging of musculoskeletal infection: Conventional agents. Semin Musculoskelet Radiol 2007;11:335-52. Fernandez-Ulloa M, Vasavada PJ, Hanslits ML, Volarich DT, Elgazzar AH. Diagnosis of vertebral osteomyelitis: Clinical, radiological and scintigraphic features. Orthopedics 1985;8:1144-50. Kahn DS, Pritzker KP. The pathophysiology of bone infection. Clin Orthop Relat Res 1973;96:12-9. Kim EE, Pjura GA, Lowry PA, Gobuty AH, Traina JF. Osteomyelitis complicating fracture: Pitfalls of 111In leukocyte scintigraphy. AJR Am J Roentgenol 1987;148:927-30. Kumar JV, Abbas AK, Astor JC, editors. Inflammation and repair. In: Robbins and Cotran Pathologic Basis of Disease. 9th ed. Philadelphia: Elsevier-Saunders; 2015. p. 69-112. Torda AJ, Gottlieb T, Bradbury R. Pyogenic vertebral osteomyelitis: Analysis of 20 cases and review. Clin Infect Dis 1995;20:320-8. Song KS, Ogden JA, Ganey T, Guidera KJ. Contiguous discitis and osteomyelitis in children. J Pediatr Orthop 1997;17:470-7.